Who Owns Alamo Rent a Car? Alamo Rent a Car is a brand of Enterprise Holdings, which is owned by the Taylor family based in St. Louis, Missouri. The Taylors' ties to car rentals go all the way back to 1957, when Jack Taylor launched Executive Leasing with seven vehicles. In addition to Alamo, Enterprise Holdings also owns Enterprise Rent-A-Car and National Car Rental. Alamo focuses on the leisure travel segment of the car rental business and is designed to offer a straightforward experience. The namesake Enterprise Rent-A-Car offers more locations and some extra perks, whereas National Car Rental is considered the most premium brand of the trio. Alamo has rental locations in every major U.S. market, and a significant presence internationally. You can drill down into specific destinations it serves around the world with this handy map. Alamo's parent company says the brand is the biggest provider of rental cars to international travelers visiting the U.S., and especially focuses on those visitors who are exploring the country on a budget. The brand has a significant presence in Europe, Australia and South America, as well as the southernmost countries in Africa. It also serves important travel destinations in the Middle East, such as Israel, the United Arab Emirates, Jordan and Qatar. The only region where Alamo does not have a significant presence in the leisure tourist market is Asia, although it does have locations in Guam and Saipan. Alamo Rent a Car first opened in Florida in 1974 as a brand focused on leisure travelers, and has stuck with that niche ever since. It is credited for introducing unlimited mileage to the market. Throughout the years, Alamo has focused on bringing technology improvements to the industry. For example, it launched real-time online booking in 1995, and a decade later was the first to introduce an online check-in system as well. The Taylor family acquired Alamo in 2007. Today, the car rental company says it is focused on fostering its relationships with airlines and agents, and continues to expand its worldwide presence. Join the frequent renter program. Join the free Alamo Insiders loyalty program to save up to 10 percent on rates and take advantage of other email offers. Use the app. The Alamo Rent a Car app, available for Apple and Android, allows you to quickly reserve a car, get directions and keep track of all your reservations. You can also link your Alamo Insiders account to get discounted rates within the app. Skip the counter. One great perk at Alamo is its online check-in and self-service kiosks, which allow you to avoid the crowded check-in counter at certain locations. Pay in advance. 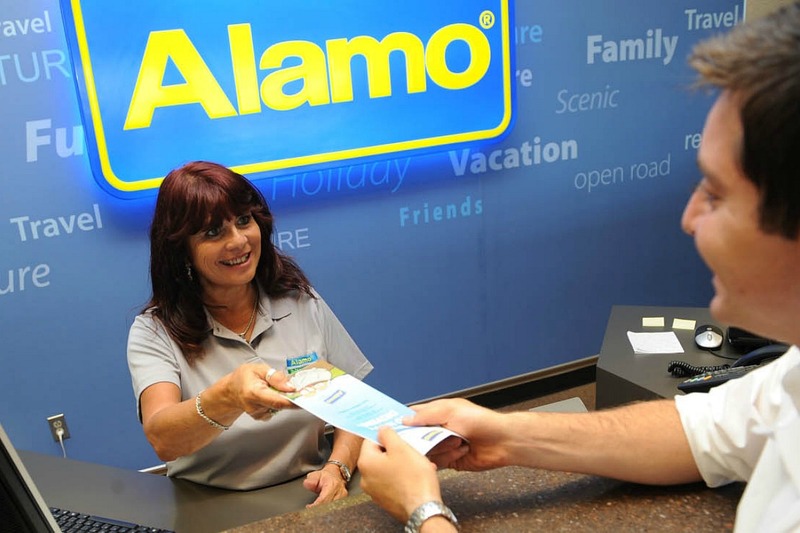 Alamo offers as much as a 10 percent discount for customers who pay in advance for their car rentals at certain locations. However, you should pay attention to any cancellation fees and do your homework about which—if any—extra insurance you may need to buy before finalizing the purchase.